Apple is predicted to continue its gains on the rest of the PC market in 2010, with Mac sales projected to grow by 26 percent while the industry is forecast to see a 16 percent year-over-year increase. If the predictions of Robert Cihra, analyst with Caris & Company, prove true, it would give Apple a total 4 percent market share for the 2010 calendar year. Cihra goes into great detail on his analysis in a note issued to investors Thursday morning. Due to Apple controlling its own product cycles, as well as pricing, he believes Mac units will grow at a rate of 1.6 times faster than the entire PC market. On average, the Mac has outpaced the PC market as a whole by 1.8 times over the last 12 quarters. With just a 4 percent projected total market share in 2010, the Mac still has "considerable headroom" for gains, Cihra said. He believes the company is still the single-best stock investors can buy in the PC market. "As the most (in fact only) innovative, highest-value (hardware+software) and profitable PC vendor, we estimate Apple having earned a Mac [average selling price] of $1,289 in CY09, down 10% [year over year] but still representing a premium of 1.8x vs. its Wintel peers," the report said. 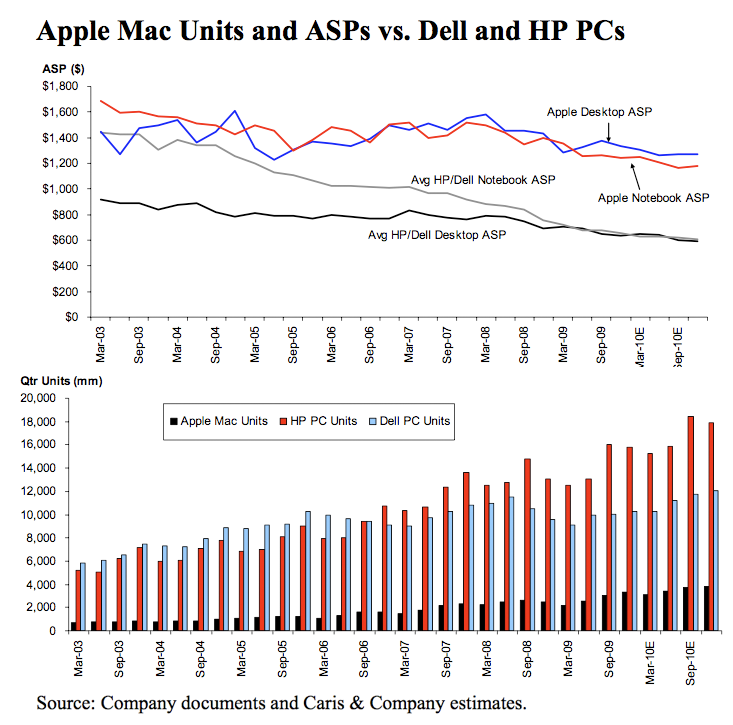 "Even more meaningful, we estimate Apple Macs generating a gross profit-per-unit of nearly $340, which is 2-3x our estimate for its peers, keeping us focused on AAPL as the single best PC market investment." Caris & Company reiterated its recommendation to buy AAPL stock, and has maintained a price target of $260. The report also noted a "brutal" erosion of the PC average selling price in 2009, dropping an estimated 16 percent year over year. Portable machines alone were said to have dropped more than 20 percent in price, driven by the popularity of low-cost netbooks. In this respect, major PC manufacturers like HP are finally catching up with a trend originally achieved by Apple way back in the second quarter of 2007: notebook prices are dropping below desktop prices, as portable machines have become the new "mainstream" PC. Cihra said the first quarter of 2009 was the first time that HP's notebook average selling price dropped below that of its desktops, nearly two years after they had flipped for Apple. Cihra expects the overall PC market to increase between 15 and 20 percent in 2010, with his current forecast at 16 percent. The report said that signs of turnaround in the PC market are showing, though the economy remains the wildcard in forecasting PC sales for next year. In September, Apple again significantly outpaced the rest of the PC market, growing 16.4 percent globally year over year, while the market as a whole grew 2.3 percent. Due to Apple's premium-priced products, the company has a worldwide revenue share of about 10 percent, while its market share hovers just north of 4 percent. Apple has been projected to sell 2.9 million Macs for the final, fourth quarter of 2009. The company's September 2009 quarter proved to be its best ever, with sales of 3 million Macs helping the company's profits rise more than 46 percent.